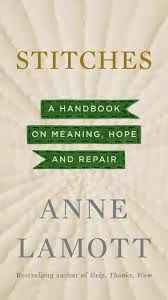 my take: This is a necessary book...perhaps not today, not right now, but questions and situations will arise in life and it's good to be prepared..."The Handbook of Meaning, Hope, and Repair." It's a delicate thing to suggest this kind of book to someone who's grieving, struggling, at the bottom. Read it yourself first, and then you'll be able to provide an oxygen mask for the next hurting, confused, blown out soul sent your way. Then, maybe, when they're able to, they'll ask how you know what to do and you can pass it along. I wanted to underline almost every sentence. So glad I own this so I can refer back and re-read. my source: Anne's coming to the Festival of Faith and Writing!